It's one of the first rules of creative writing you'll hear. It may be the rule you hear the most: "Show, don't tell." Today I'll explain what that rule means, why it's in place, and then why following it too closely can actually harm rather than help your writing. There are places in writing where telling is just frankly better, and even more powerful. Honestly, almost any beginning writer who is getting into writing needs to hear this advice, and probably several times. When I was in college, this was like scripture. I heard it every week, if not every day. This is because naturally, we are wired to "tell" a story rather than "show" one. Telling is easier, and if we don't know the difference, we just do what's natural and easy. But what is the difference? And why does it matter which you use? Yawning, Emily dragged her backpack on the way to her bedroom. Her eyes drooped shut with each step. She fell into her bed and her shoes blackened the covers. She rubbed her eyes--mascara gritted against her skin--then flung her arm over her face to block out the light. In my second example, I don't just tell the reader Emily is tired, I show them. There are a few reasons to do this. First, if I simply say "Emily was tired," as an audience, we don't get a visual for what "tired" is, how tired Emily is, or what kind of tired she feels. It's vague and general. Is Emily a bored kind of tired? Or physically tired from running a mile? Or sleepy-tired? But when I show it, it's clear she's sleepy-tired. How sleepy-tired? Tired enough that she can't pick up and carry her backpack, so tired that her eyes droop shut and she doesn't bother to take off her shoes before "falling" into bed. She doesn't even wash off her makeup or turn off the room's light. Second, when you show instead of tell it immerses the reader into the story so that they feel like they are experiencing it instead of just reading about it. It's like they are there in the house with Emily, or are Emily herself. One of the ways to do this well is to appeal to the senses: sight, sound, touch, smell, and taste. In my second example, I appealed to the senses of sight and touch. (In contrast, in my first example, I appealed to no senses.) It's important to immerse the reader, so that they are experiencing the emotions in the story. If you "tell" them everything, you're (almost) never putting the emotions in the reader, so the story won't be as powerful. When you "show" the story to the reader, you are allowing them to interpret and come to their own conclusions, rather then you telling them what to think and believe. They become the character. How much emotion do you feel from that? Do you feel like you are in the story? Does it have you on the edge of you seat? Probably not. Most all beginning writers write stories this way, which is why learning to show, not tell, is preached just about everywhere. Telling is easy. Showing takes work. But like any writing rule, if you treat this one like a commandment, it can actually hurt your writing and take the power out of your story. Here is why you need telling. In my showing example above, you probably saw that it took much longer for me to show you Emily was tired than it was to tell you. If you show absolutely everything in your novel (or probably even short story,) the pacing of your story is going to suffer. Sometimes it's not important to show your characters seeing their friend's cats--it doesn't matter much what the cats look and sound like and nothing really important happens during the scene--but it's important for the reader to simply know the fact that they saw the cats. A good example of this comes from The Hunger Games. After Katniss gets mad and shoots an arrow near the Gamemaker, we are told, that Katniss spent the afternoon crying (or something like that). It wasn't important to the story that we see, hear, and experience Katniss crying. It was enough to just know that she was. In contrast, take note that whenever you have an important moment or a highly emotional moment in your story, you (almost) always want to show it. Showing helps us relate to the story on an empathetic level instead of a sympathetic one (see my post on writing empathetically instead of sympathetically and sentimentally), because showing creates emotion and tension in the reader. BUT again, remember, moments that aren't that important to experience firsthand but the reader just needs to know about, should be told. If we showed all the less important parts, the story would drag like crazy. It would get boring. We don't need to know all the details about your character's bath, just tell us he took one. How to Break Writing Rules Right: "Don't Use Adverbs, Adjectives"
Having your reader experience your story and feel what your character feels on an empathetic level is vital to (almost) all good stories. That's why showing is so important. But there are actually times when you want the reader's experience to deviate from your character's. Why would you want to do that, you might ask? Well, what if your character is unlikeable? Your reader won't be able to stand them if it's all showing. What if your narrator has a big personality and a huge voice? Or the content of your story is so shocking, you need to distance the reader from it? Telling is a great, if not necessary, tool to do all that. The next day, Joseph went to the batting cages, then on Thursday he went also. His last practice was the last day of the month. Telling is great for events that occur repeatedly over the space of time. At nights Yolanda would lie awake in bed thinking of the car crash, and in the mornings she would go through her routine like a machine. It was only in the afternoons, when she was tutoring her students one-on-one, that she felt like her old self. Because this isn't a single day or a single event, telling is a great option for writing it. For all of the different "times" you can tell well, you can pick up the book Showing & Telling by Laurie Alberts. Sometimes in your story you might find it's important to give background information, but you need to do it quickly without slowing your pacing, or maybe the details just aren't important. Telling works well for that too. The Johnsons had owned that lot for over 50 years, and all any of them had bothered to do with it was let some teenager build dirt jumps for his BMX bike. Some people will avoid putting any background information in their story because it's telling, but background or historical information, when used well, can actually make your story feel more real, and can give your world and characters more depth. Telling can be a remarkable tool for driving home exceptional ideas and concepts. It has to do with packaging big emotions and ideas in a straightforward style. And sometimes trying to show those emotions and ideas would actually weaken the punch. Finally, the truth. Lying with his face pressed into the dusty carpet of the office where he had once thought he was learning the secrets of victory, Harry understood at last that he was not supposed to survive. His job was to walk calmly into Death's welcoming arms. . . . He felt his heart pounding fiercely in his chest. How strange that in his dread of death, it pumped all the harder, valiantly keeping him alive. But it would have to stop and soon. Its beats were numbered. How many would there be time for, as he rose and walked through the castle for the last time, out into the grounds and into the forest? . . .
Would it hurt to die? All those times he had thought that it was about to happen and escaped, he had never really though of the thing itself: His will to live had always been so much stronger than his fear of death. . . . [but] it was over, he knew it, and all that was left was the thing itself: dying. . . . He envied his parents' deaths now. This cold-blooded walk to his own destruction would require a different kind of bravery. . . .
Why had he never appreciated what a miracle he was, brain and nerve and bounding heart? It would all be gone . . . or at least, he would be gone from it. . . . His heart was leaping against his ribs like a frantic bird. Perhaps it knew it had little time left, perhaps it was determined to fulfill a lifetime's beats before the end. It's the concepts and statements that are interesting, that make us feel something. They're saying a lot in a short, simple space, and sometimes that's where the real power comes from. If J. K. Rowling just tried to show all of this, it wouldn't have been as powerful, and in fact, some readers would have missed the bigger concepts altogether. This passage isn't weaker because it's telling, it's stronger. So when you have thoughtful concepts, or big ideas, don't be afraid to tell them. If you try to follow the "Show, don't tell" rule religiously, you're going to be axing some of the stuff that is most unique to fiction writing: your character's interior. This is because any sense of what your character is thinking is going to be written in a telling style. I've heard writers say that you should never tell what your character is thinking, because it's just that, telling. They say you should write your story like a movie. I disagree. And a lot of readers would too. One of the things that a written story can do that other forms of storytelling can't is to tell us what the character is thinking. And we should use that to our advantage, to add to the story. Writing purely "cinematically" for the sake of it can actually weaken a story--it's like playing the piano without all your fingers. Written stories have something others don't, and we should use that. Some people may say they don't like when writers write the character's thoughts, but what they may really be saying (even if they don't know it) is that they don't like reading poorly written thoughts. Besides, the truth is, that writing your character's internal thoughts and feelings can actually be showing and telling simultaneously. When you get deep, deep into point of view, you are showing your character's thoughts, and people think in a telling style. For more on that, see my post on point of view penetration. Speaking of thoughts being thought in a telling style, first-person stories often use a telling style--since they are told from the character's perspective, in the character's voice. People naturally talk in a telling way, and so do characters. Now, some new writers make the mistake of thinking this means that writing in first-person is easy because you can just tell everything. Sure it's easy--just like writing poorly is. Writing a strong, authentic first-person is much more difficult than that. You can read my post about first-person here. Whether you are writing in first-person or third-person, your narrative voice might be better, might have more "character," if you use telling. In my experience, the strongest, most characteristic voices tell, plain and simple. 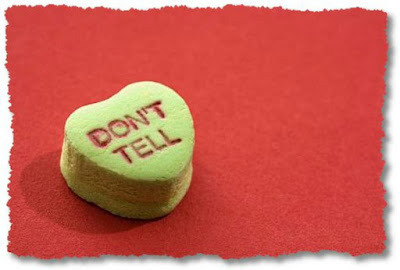 They don't necessarily tell everything, but they aren't afraid to use telling. Look at this excerpt from The Fault in Our Stars, by John Green, who is a master with voice, also note it's in first-person (yes, I've used this example as a reference many times before, but it works and it's faster than searching for a new one). So here's how it went in God's heart: The six or seven or ten of us walked/wheeled in, grazed at a decrepit selection of cookies and lemonade, sat down in the Circle of Trust, and listened to Patrick recount for the thousandth time his depressingly miserable life story--how he had cancer in his balls and they thought he was going to die but he didn't die and now here he is, a full-grown adult in a church basement in 137th nicest city in America, divorced, addicted to video games, mostly friendless, eking out a meager living by exploiting his cancertastic past, slowly working his way toward a master's degree that will not improve his career prospects. . . Guess what? That's all telling! But it's good telling. Even in telling there is weak telling and strong telling, just like everything else. If you had shown all of this, you would have missed a lot of the protagonist's voice. If we never used telling, it's likely a lot of the narrators of the world would sound the same--and they'd be a lot more bland because of it. Similar (but different from) voice is tone. Sometimes telling is just what you need to create the right tone, especially when it comes to humor. J. K. Rowling uses telling to create humor through tone in Harry Potter and the Half-blood Prince, when Harry takes a potion that makes him lucky. I love how J.K. Rowling switches the tone to account for Harry being under the influence of Felix Felicis. It was when he reached the bottom step that it occurred to him how very pleasant it would be to pass the vegetable patch on his walk to Hagrid's. It was not strictly on the way, but it seemed clear to Harry that this was a whim on which he should act, so he directed his feet immediately toward the vegetable patch, where he was pleased, but not altogether surprised, to find Professor Slughorn in conversation with Professor Sprout. Harry lurked behind a low stone wall, feeling at peace with the world and listening to their conversation. If you haven't read the Harry Potter books, the humor might not be as clear to you, without the context, but trust me, the humor is all here, especially in comparison to how the rest of the book is written. Again, most of this is telling, but it's good telling. Some new writers might have a difficult time discerning telling like this example, from showing, but discernment will come with practice. Notice how the passage is summary? That's telling. This actually leads me to one of the tricks to writing strong telling as opposed weak telling--you pull in showing techniques into your telling, but I'll blog about how to write good telling in a future post. If all of this is a lot to take in, and you still aren't sure if you can discern when to use telling or when to use showing, a percentage rule is usually a good place to start. For most stories, 60-80% showing and 40-20% telling is a good guideline until you get the hang of when to do which. You can also check out Showing & Telling, which will tell you just about everything you need to know about each. How to Break Writing Rule Right: "Don't Use Adverbs, Adjectives"
Wow. I think I'll have to print this post out. I've always been afraid of telling, I didn't know what telling was good or when it was bad, that I wasn't showing enough. This really helped me understand more about it! Glad it was helpful! Good luck with your writing! Great article! Really good points all around. I think the rule is mostly directed at beginning writers that often struggle with only "telling" for most of their early works. However, there's no follow up to tell them that it's acceptable to tell sometimes. I totally agree, and you said it so simply and clearly. This is such a tricky subject. It is nice to see it clarified. I look forward to reading more articles like it. I especially agree about telling and humor. I like to inject humor into my stories, and like J.K. Rowling and Douglas Adams, this kind of humor generally benefits from telling. It just wouldn't be funny if you tried showing it. Humor is a big one you have to tell with, and I used to really struggle with it because I was taught that we shouldn't tell. I could hardly ever write anything that funny when I tried to follow that! Vague Vs. Ambiguous: Which are You Writing?